Developers asked to incorporate historic preservation into proposals for Brielle Avenue parcel. 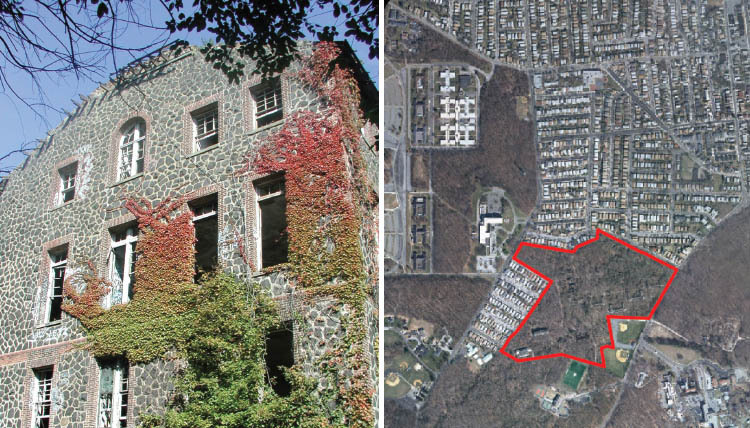 The City’s Economic Development Corporation on March 6, 2012 issued a request for expressions of interest for the redevelopment of an approximately 46-acre site located on Brielle Avenue in the Willowbrook neighborhood of Staten Island. The majority of the property was originally used as an institutional work farm for the poor, known as the New York City Farm Colony, but has been vacant for over 30 years. The Landmarks Preservation Commission in 1985 designated the site as part of the Farm Colony – Seaview Hospital Historic District. EDC, working in coordination with Landmarks and local City Council Member James S. Oddo, seeks proposals that would transform the area in a way that would complement and enhance the surrounding community. The site is also within a Special Natural Area District that mandates City Planning Commission review of proposals. The site contains eleven buildings built between 1904 and 1939, which are all generally in a state of major disrepair due to fire, weather, and lack of maintenance. The site also contains approximately sixteen acres of undeveloped land at its north end. There is a small potter’s field towards the northwest corner of the site that may contain human remains or artifacts. EDC initially sought proposals for the site in 2005, but did not proceed with development. With this RFEI, however, EDC is encouraging developers to propose a wider range of uses and more flexibility in site design. EDC will consider proposals for all or portions of the site, but will not consider industrial uses for the site. According to the RFEI, the site features sufficient unimproved land area for master planning, historic assets, and views and access to the Staten Island Greenbelt, a 3,500-acre park network. It is nearby the College of Staten Island, Sea View Hospital Home Rehabilitation Center, and the Greenbelt Recreation Center. The RFEI asks developers for proposals that include the stabilization or restoration of the Farm Colony buildings, and enhances the area’s natural resources and the Greenbelt. All work will require Landmarks’ approval. Proposals must be submitted by May 31, 2012. EDC: Request for Expressions of Interest – Brielle Avenue (March 6, 2012).